I’m a city girl. I did not grow up camping, have never pitched a tent and know nothing of the Girl Scouts beyond Thin Mints or Samoa cookies. Certainly no one would use the words “rugged” or “outdoorsy” to describe me. But I ended up loving every minute in Mongolia, a country steeped in history, stunning scenery and welcoming locals. I stepped outside my comfort zone and into the trip of a lifetime. And here’s why you should too. Mongolia, a country of 3 million people slightly smaller than Alaska, is one of the most sparsely populated places in the world. You can go hours, even days, without seeing another human while travelling through Mongolia’s countryside. Instead, you’ll find a vibrant blue horizon and empty, rolling grasslands dotted with horses, cows, sheep, goats and yaks. You’ll be forced to unplug as cell service and Wi-Fi is mostly non-existent outside of the larger cities. So say goodbye to Facebook rants and traffic jams and say hello to a seemingly endless untouched landscape. Your only roadblock is the occasional cow. As avid travellers accustomed to DIY adventures, we rarely book tours. But my top tip for this wonderland is to find yourself an expert. There are few road signs and English is not widely used, so a local guide with knowledge of the routes and language is highly recommended. You will also need a four-wheel drive vehicle to navigate the mostly unpaved terrain. Our expert, good-humoured guide, Munkh Bileg, whom we hired through Nomadic Discovery, tailored our private tour to our interests and time constraints to maximise our Mongolian experience. We rode camels across sand dunes and horses at sunset. We met herder families and sampled local cuisine, including fermented mare’s milk and dried curds. Most of our days were spent off-roading over mountains and across rivers, simply soaking in Mongolia’s otherworldly landscape. 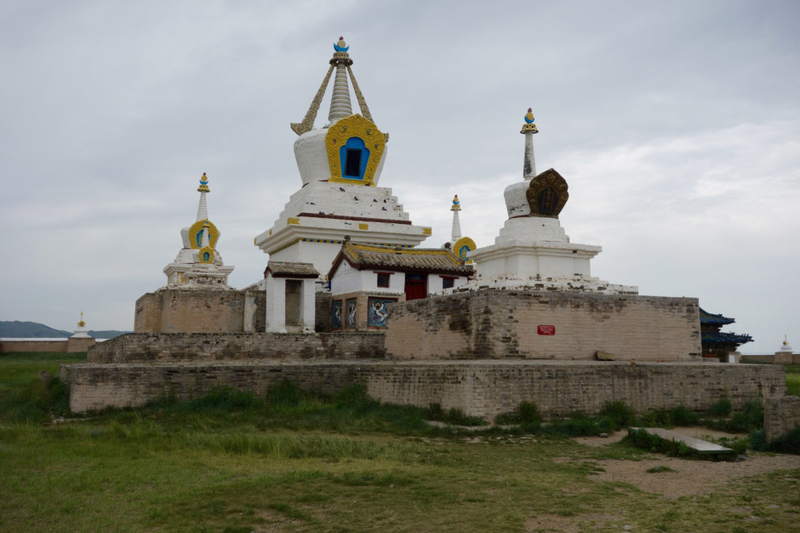 For the history buff: Erdene Zuu Monastery is located in Kharkhorin, on the northern border of the Ovorkhangai Province. Get your fill of ornate Buddha statues, elaborate wall paintings and artefacts dating back to the 18th century while exploring the three remaining Chinese-style temples at one of the oldest Buddhist monasteries in Mongolia. 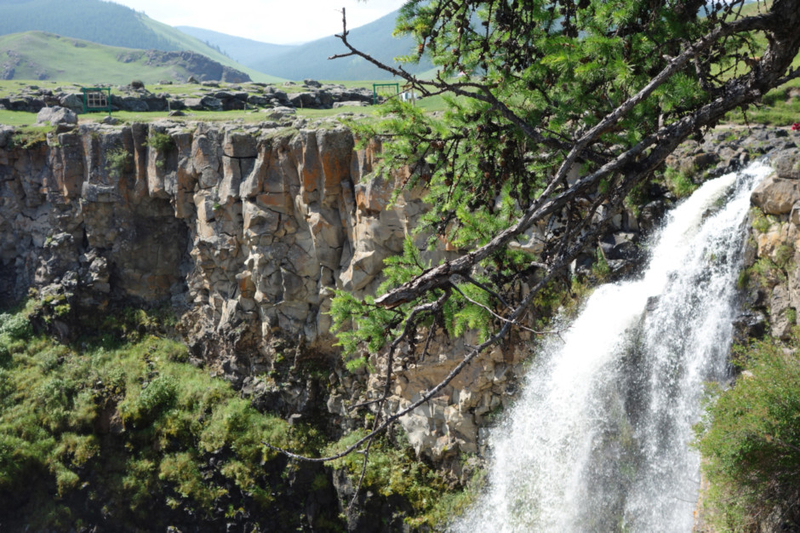 For the nature lover: The Orkhon waterfall (also called the Ulaan Tsutgalan waterfall) is located in Ovorkhangai Province, around 120km from the town of Kharkhorin. A hike to the edge of this massive, 65-foot (20-meter) waterfall offers stunning views of dark volcanic rock surrounded by a lush valley. Also, be sure to stop by the pristine Lake Ogii in the south eastern corner of the Arkhangai Province. Like most of Mongolia, it felt like we had travelled back to a time before humans as the only other visitors were a group of horses splashing and lounging about in the calm waters. For a glimpse of desert dunes: Elsen Tasarkhai is a sand strip located in Bulgan Province. While we didn’t have time to explore Mongolia’s famed Gobi Desert, we made a quick stop at this 80km stretch of golden hills for a relaxing tour via camels. 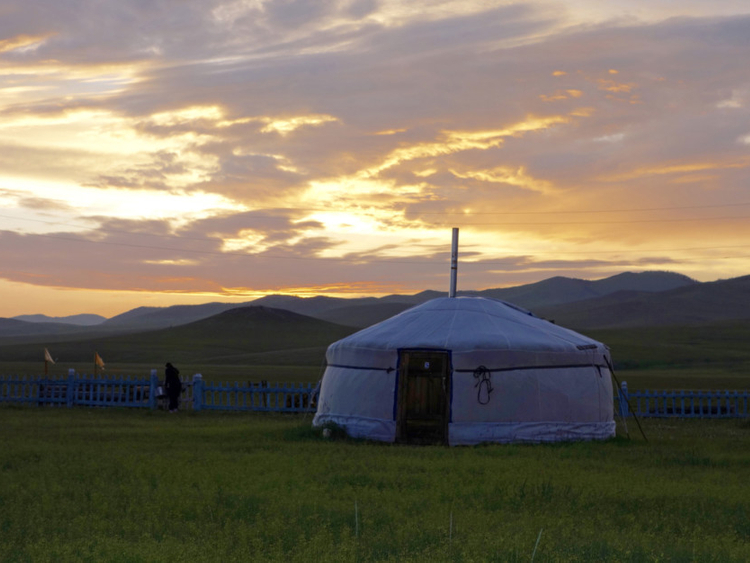 As the sun sets there is little else to do besides stargazing and cosying in your ger (pronounced “gare”), a traditional nomad home. Apparently we were right on trend as an $8,000 (Dh29,376) version of the circular tent, or yurt, was featured in the holiday gift guide from Gwyneth Paltrow’s lifestyle website, goop. Our home base was the Tsagaan Sum hot springs and tourist camp in Khoton Soum, Arkhangai Province (approximately 460km west of Ulaanbaatar). The hustle and bustle of city life was but a distant memory as we fell asleep to the crackle of a wood-burning stove and woke to the sounds of horses neighing outside our ger. The flies will swarm as soon as you step outside, as will the mosquitoes. So pack bug spray and long-sleeved layers. Western-style bathrooms are few and far between outside of Ulaanbaatar. Be prepared to cop a squat when nature calls. Ulaanbaatar is Mongolia’s bustling, traffic-jammed capital city, but tourist attractions are few. Stop by a grocery store to load up on water, snacks and essentials. Then head to the countryside. Speaking of food, get ready for meat- mostly lamb_and lots of it. Mongolian cuisine is about as “farm to fork” as it gets. Refrigeration in the countryside isn’t common so your dinner was likely plucked from the pasture that very day.